Do you have a specific vision for your home that requires a unique solution? Do you need cabinets in an area of your home that has non-standard measurements? Does your client want high-end finishes during their remodeling project, and you need someone who can provide the attention to detail they require? 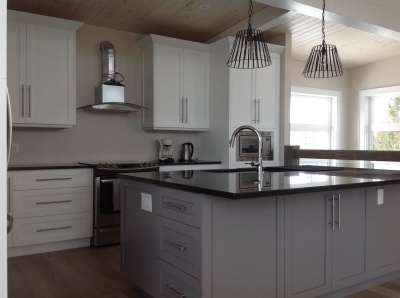 At McMillan Millwork & Joinery, we are happy to say that we are your first resource when you need custom cabinetry in Collingwood, Ontario and The Blue Mountains. Not only can we work with homeowners on an individual basis, but we are also happy to assist contractors who need an expert eye to ensure the final touches are what a client has envisioned for their space. Quality Craftsmanship – Our approach to custom cabinetry is to combine old-fashioned craftsmanship with modern production techniques. This allows us to achieve the highest-quality cabinetry while still meeting deadlines and providing high-end solutions. Collaborative Approach – Our collaborative approach to adding custom cabinetry is based around the ideal that clients have a unique vision that should be respected as they remodel or upgrade their space. Our number one goal is to listen to your needs, so we can ensure you love the end result. Timeless Beauty – Our custom cabinetry offers timeless beauty and lasting joy for years to come. Our knowledge of woodworking is second-to-none, and we look forward to working with you to achieve your goals. Contact us at McMillan Millwork & Joinery today to schedule a consultation and to learn more about our products and services. We look forward to working with you.